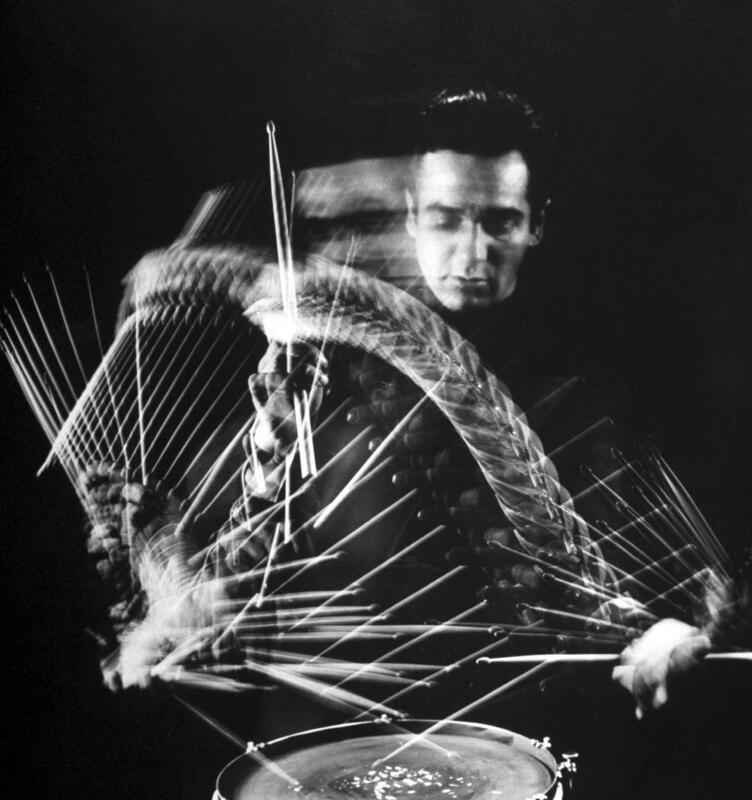 Drummer and bandleader Gene Krupa (1909 - 1973) shows off his cymbal technique, circa 1940. Krupa’s reputation still looms large in pop culture: Rolling Stone recently put him at Number 7 in its list of the 100 greatest drummers of all time. Yet among jazz critics and historians, and many musicians, it has become part of the received wisdom that Krupa was an unmusical drummer, and that he played too loud. At the most, it seems that Krupa gets credit — mainly via Benny Goodman’s anthem “Sing, Sing, Sing” — for popularizing the drum feature in jazz and pop. It’s a problem all too common in jazz. It seems that if you gain a certain level of popularity, critics and musicians can turn against you. Along with professional envy, this seems due in part to an elitist belief that if so many people like your music, you must be doing something wrong. It’s also commonly stated that he was “old fashioned” — but considering that he was born in 1909, that’s hardly fair. He must be judged in the context of his era. In this installment of Deep Dive, we’ll listen closely to some musical highlights, making the case that he was a creative player with a wide dynamic range. Krupa was born in Chicago on January 15, 1909. He was gigging in Wisconsin when he was asked to return to his hometown to join Thelma Terry’s band, in 1927. Given that this is Women in Jazz Month, let’s talk about Terry a bit. A fine bassist almost eight years older than Krupa, she already had a lot of experience performing with a variety of dance bands. 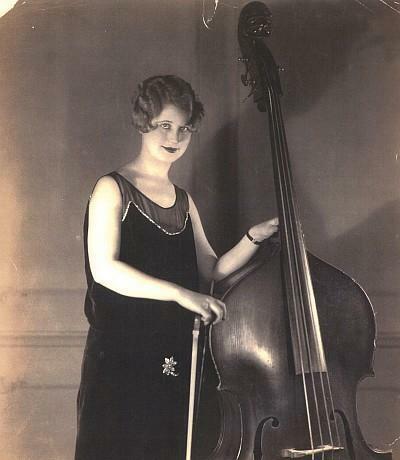 In fact, she may have been the first woman instrumentalist to lead a dance band. (She was certainly one of the first.) On the strength of her six recorded songs (one of which had an extra take), she was an excellent anchor whose playing was full of rhythmic variety and percussiveness. While she isn’t typically credited as a member of the Austin High gang, Terry had attended the same school a few years earlier, and probably lived in the area. It might even be how she knew Gene. On March 29, 1928, Krupa recorded with Thelma Terry and Her Playboys (stylized as “Play Boys” on the record labels). The first number, “Mama’s Gone Goodbye” — a bit of a jazz standard that had already been recorded a number of times over the previous five years — begins and ends with a duet between his cymbals and Terry’s bass, which makes me think she and Gene enjoyed working together. As for her playing on the track, listen for how she breaks up the rhythm at 0:30. Her rhythmically inventive bass playing is so prominent between 1:20 and 2:00 that this whole passage is essentially a bass solo with written sax solo and band accompaniment. In fact, she and Gene are the only ones improvising on this recording. By the late 1930s, Krupa defined drumming for many Swing Era listeners, because of the unprecedented popularity he enjoyed in groups led by clarinetist Benny Goodman. His tom-tom introduction to Goodman’s 1937 hit “Sing, Sing, Sing” made him a household name, and a star in his own right. Gene Krupa's introduction to "Sing, Sing, Sing," recorded in Hollywood on July 6, 1937. Drummer Gene Krupa playing drums at Gjon Mili's studio. But the evidence says otherwise. Here is Krupa playing “Sing, Sing, Sing” on Goodman’s famous Carnegie Hall concert 80 years ago, in January of 1938. Gene Krupa's introduction to "Sing, Sing, Sing" with the Benny Goodman Orchestra at Carnegie Hall, January 16, 1938. The first thing you notice is the energy that Gene Krupa brings to this band. Without Krupa, in my opinion, the Benny Goodman Orchestra would have been a very clean, very tight but not very exciting organization. His playing lifts them right off the ground. Notice, too, how much variety Krupa packs into his opening riff. It’s obviously unfair to suggest, as Jo Jones did, that he just repeats a similar pattern. Excerpt of "Don't Be That Way" from Benny Goodman's Carnegie Hall concert, January 16, 1938. Goodman’s band (and Goodman himself) get off to a stiff start, and the audience sounds unmoved. But then, as you hear in this clip, Krupa starts dropping “bombs” — strong drum accents — and plays a two-bar break that lasts only three seconds but drives the audience wild. You can hear for yourself how they, and the other musicians, respond to Krupa’s drumming. Krupa did like to play his bass drum and tom-toms, especially with a big band. But he could also play with a lighter touch, as he did in the same concert on “China Boy,” which he played with wire brushes. Listen to his unusual accenting as he drives the quartet. It’s fascinating, never just 1, 2, 3, 4. 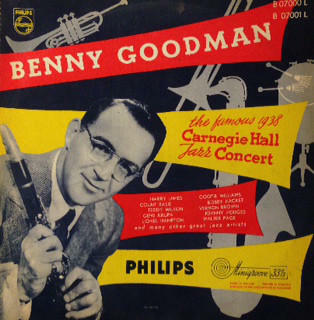 Excerpt of Benny Goodman's clarinet solo during "China Boy," at the 1938 Carnegie Hall concert. Gene Krupa's drum solo on "China Boy," from Benny Goodman's 1938 Carnegie Hall concert. Krupa is also very interactive — certainly by the standards of his generation. There were very few drummers in the mid-‘30s who would “echo” the soloists, as Krupa did. Clearly, he was listening to everything they played. Excerpt of "Barrelhouse," recorded by Gene Krupa in November 1935. As we can hear, Krupa, Stacy and Crosby are going back and forth and breaking up the beat: it’s a marvelous and timeless example of jazz playing. This kind of interaction is what you might expect from drummers today, but it’s certainly not typical in the 1930s. Excerpt of "Seven Come Eleven," recorded in 1963 by a reunited Benny Goodman Quartet. Almost a decade later, Krupa appeared on a televised all-star jazz program sponsored by Timex and produced by Donald Ross. Watch the broadcast, from October 23, 1972, and you’ll witness Krupa’s alert playing, and his wide range of dynamic levels. As trumpeter Doc Severinsen announces, this was the first televised appearance of the original Goodman quartet — though it’s a quintet, because George Duvivier has been added on bass. The quartet’s segment begins at 27:28 and runs about 12 minutes. It’s clear from the start that all four musicians are exhilarated to be playing together, and the very first number is an ideal example of Krupa’s work, illustrating his alertness, energy, variety and overall musicality. So as far as I’m concerned, Gene Krupa was a marvelous drummer who got a bad rap just because he was more popular than some critics and musicians thought he should have been. World of Gene Krupa: That Legendary Drummin' Man, Bruce Klauber’s biography and reference work, is drawn from many of Krupa’s published interviews. There are 48 pages on Krupa in the late Burt Korall’s Drummin’ Men: The Swing Years. Deep Dive with Lewis Porter: The Inspiration(s) Behind John Coltrane's "Impressions"
John Coltrane, the revered saxophonist and composer, would be turning 91 this week. This year also marks the 50th anniversary of his death, at the age of 40. Had he lived, he might have been astonished to witness how the power and impact of his musical legacy continues to grow. This year, a documentary film by John Scheinfeld, Chasing Trane, has been screening worldwide to considerable acclaim. (Full disclosure: I appear in the film several times.) And just this month, a beautiful mural of Coltrane was unveiled in North Philadelphia, near his childhood home.